Reminds you to take a break. Is there a better alternative to Rest? Is Rest really the best app in Productivity category? Will Rest work good on macOS 10.13.4? 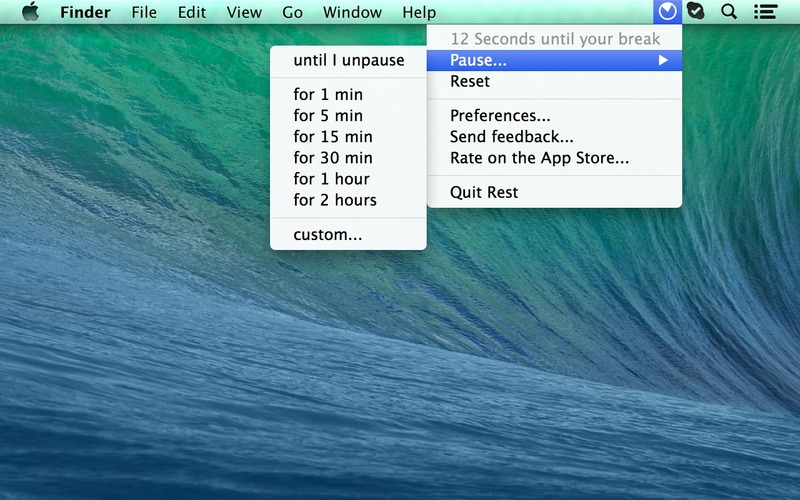 Rest sits in your menu bar and reminds you to take a break every now and then. Improve your productivity and keep your eyes healthy. Pomodoro support. With custom intervals and an optional longer 4th break, you can now use the Pomodoro time management technique with Rest. An unobtrusive, beautiful menubar indicator. Beautiful, full-screen break reminders (optional) *. 12 soothing sounds to pick from - from a decisive gong to a beautiful piano melody. Rest needs a review. Be the first to review this app and get the discussion started! Automatic break detection (optional) - step away from your computer to "take your break", even if it's earlier or later than planned. Rest adjusts automatically. * Note: images available with the full-screen break notifications vary from system to system.